I am a big believer in supporting small businesses and local manufacturers. 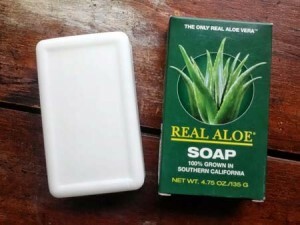 Real Aloe Soap Bar 100% Grown in Southern California is exactly just that for me. It is really wonderful to know that a good soap can actually make you feel, kind of whole(some). On my very first usage I felt compelled to tell you all about it. Real Aloe 100% Grown in Southern California (manufactured in Las Vegas) is exactly what the company claims it is*. This soap is really dense and has a very, very light smell of Aloe Vera and a back hint of citrus. Real Aloe lathers up really nice and it leaves a really nice silky feeling to the skin. This soap is all about moisturizing and healing the skin after a long day in the Beach Sun. I will say this again, “if you are still using the major brand soaps that you find at your local pharmacy or supermarket like Dial, Irish Spring and all those other mass produced brands you are not doing yourself any favors” Trust me, bad soap is like a bad cup of morning coffee. Ingredients: Sodium Palmate, Sodium Palm Kernelate, Real Aloe Aloe Vera, Water, Glycerine, Sodium Chloride, EDTA, Less than 0.5 percent of Citric Acid, Sodium Benzoate, Potassium Sorbate. *Company History: Real Aloe was founded in 1972 as a result of the personal experience of Frank Mundell, as to the wonderful benefits of Aloe Vera and his desire to share his experiences with others. Since the company’s inception, no effort has been spared to bring to you Aloe Vera products with the greatest purity and potency possible. Real Aloe is proud to produce and represent the finest Aloe Vera products available in the marketplace.